This wonderfully written YA fantasy novel would appeal to fans of Robin McKinley’s fairy tale works. Rhea’s life takes an unexpected turn when a local lord requests her hand in marriage. She doesn’t want to get married, much less to a stranger who’s as old as her father, but when you’re the daughter of a miller, you can’t tell a lord no. Then Lord Crevan demands that Rhea visit his manor house before the wedding. There she finds both dark magic and his six other wives. If Rhea doesn’t act quickly, she’ll share in their fate. I picked up The Seventh Bride because I’d enjoyed many of the author’s shorter works. “The Jackalope Wives,” which she wrote under the name Ursula Vernon, won a Nebula for best short story, and I adored her take on Cinderella in “The Dryad’s Shoe.” So it seemed high time to try a longer work by her, and why not something else fairy tale inspired? While The Seventh Bride veers substantially from the original tale, it is clearly reminiscent of the “Bluebeard” fairy tale. I adored Rhea. She’s brave, practical, and doesn’t put up with nonsense. And Vernon’s writing style makes her interior thoughts quite humorous. Rhea actually reminded me a lot of Pratchett’s Tiffany Aching, which is high praise indeed as Tiffany is one of my all time favorite characters. Rhea is also a rare creature – a teenage female protagonist without the slightest hint of a romance plot! Instead, Rhea’s connections are focused on her family, who she wants to protect even if it means marrying Lord Crevan, and her developing friendship with a couple of the other wives. Oh, and the hedgehog who acts as her helpful guide. Rhea lives in a loosely sketched, charming fairy tale world. Small amounts of magic permeate ordinary life. For instance, a couple of times a year Rhea’s family’s mill gets invested with gnomes and they have to go to the hedge witch for a charm to drive them out. Also, eggplants have a tendency to fly. However, large spells and sorcerers are the stuff of legends and bed time stories. But did I mention that Lord Crevan is a sorcerer? And his manor house is no ordinary house. T. Kingfisher is the pen name Ursula Vernon uses for adult aimed work, but I would not have placed The Seventh Bride as an adult fantasy novel. Our youthful fifteen year old protagonist gives this story a decidedly young adult feel. That said, it could easily be enjoyed by all ages. 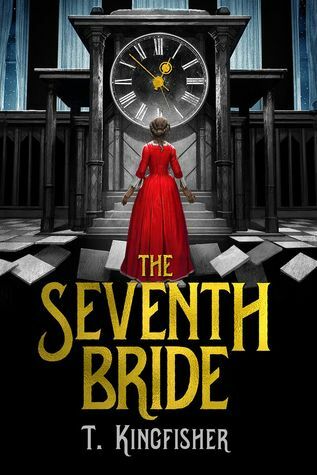 If you ever have the hankering for a wonderfully written, YA fairy tale, I suggest picking up The Seventh Bride. If you’re not convinced, just try a few of Ursula Vernon’s short stories. I’d actually suggest starting with Jackalope Wives! It’s a short story that’s free online so easy to access, and it’s super good.